Snacking gets a bad rap. It seems to have a negative connotation, like you’re cheating somehow or breaking some rule about not eating between meals. It’s certainly not going to be a good habit if you use snack time as an excuse to munch on chips and candy bars. Each snack is an opportunity to make that day’s nutritional impact better or worse. When you choose wisely, snacks can add valuable nutrients to your daily intake, and more importantly, give you something to look forward to at 3:00 pm. Most people will say that when they’re hunting around for a snack they want crunchy, chewy, salty, or sweet. I think I’ve got all those taste and texture bases covered with today’s list of snack ideas, but my focus was really on combining the salty and the sweet without losing sight of nutrition. It is possible to satisfy that need with foods that are healthy and yummy and yes, even feel like a treat. I present to you 5 notions of what snack time can look like, in order of calorie content from lowest to highest. This one seems simple, but it makes me happy. 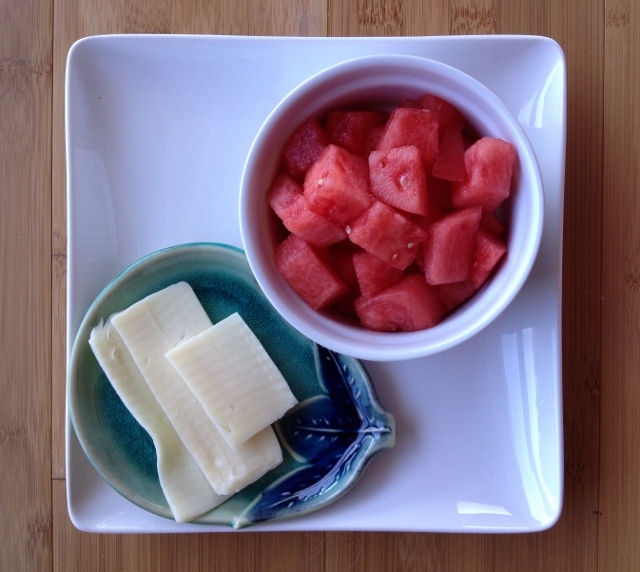 The cheese is definitely salty, but it’s also savory which is a nice contrast to the sweet and juicy melon. I happened to have a brick of mozzarella on hand, but a string cheese (which is exactly 1 ounce) would make pulling this snack together even easier…no slicing necessary. Besides yumminess, these 130 calories provide 20% of the Daily Value for calcium and vitamin C. They’re also a good example of why sugar on a Nutrition Facts label (or in a recipe’s nutrient analysis) isn’t always a bad thing. The way it works now, total sugar is listed and no distinction is made between natural sugars (from dairy and fruit) or added sugars (from corn syrup or brown sugar). The 10 grams in this snack are definitely natural sugars, but it can make you hesitate when you see any grams of sugar listed. From what I’ve read, there’s a good chance the new and improved Nutrition Facts label that’s been proposed will somehow make this more clear. In the meantime, when in doubt read the ingredient list. 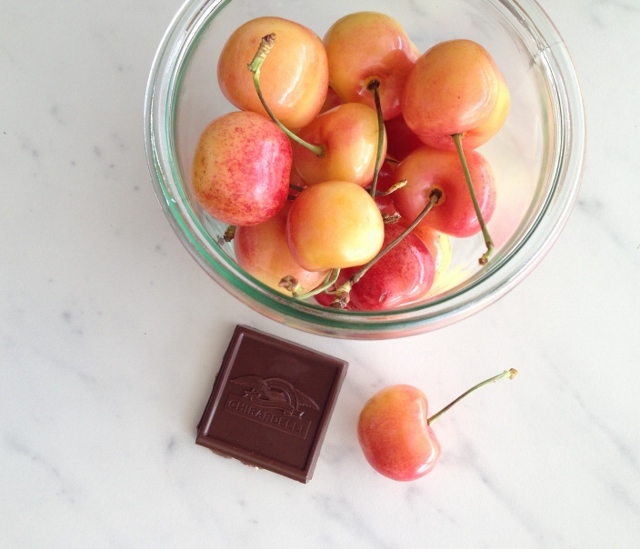 While chocolate and cherries pair exceptionally well together, I know fresh cherries can be hard to come by. So, grapes would be an easy year-round substitution or any other favorite fruit. This is probably the most dessert-like snack on the list, but put aside any guilt; Rainier cherries and dark chocolate both serve up antioxidants in delicious packaging. 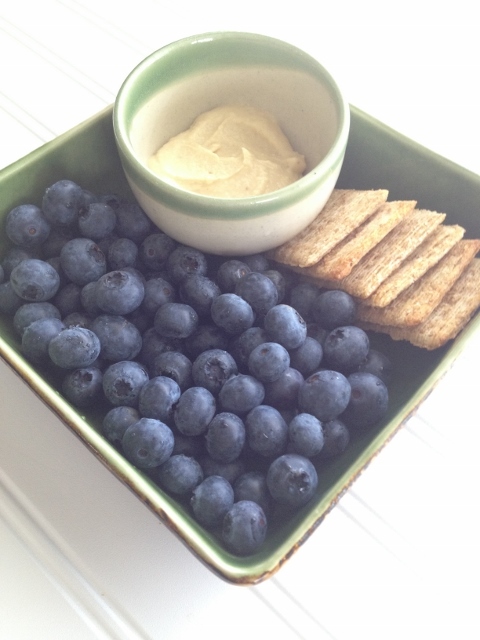 This one’s kind of fun because you have a job to do: dipping the crackers in the hummus. You probably recognize these as Triscuits, but you could use any favorite whole grain cracker you have on hand like Ry-Krisp or Wheat Thins; just keep an eye on the portion size to keep the calories controlled. With my example, the crackers are contributing 120 calories to the snack’s total. Tofu’s not just for dinner. It can also make for a handy, high protein snack during the day. 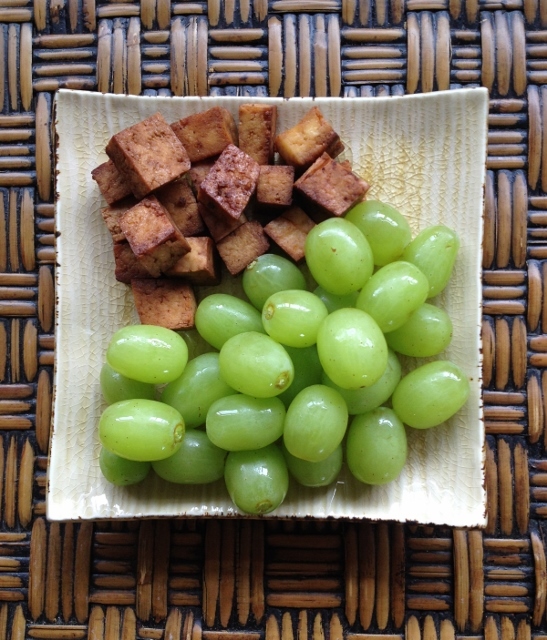 I’ve included a recipe below to make your own Baked Tofu Bites, which is what’s pictured above, but you could buy the baked tofu that’s already flavored (like teriyaki or sesame peanut) for an even easier option. The homemade nuggets are definitely good right out of the oven, but I especially like the firm texture they take on after they’re refrigerated so I usually eat them cold. This vegan snack brings with it 20% of the Daily Value for iron and 8% for calcium. These make a great addition to dinner or a handy snack to pop in your mouth on the go. Mix sesame oil and soy sauce together in a 13x9-inch baking dish. Add tofu cubes and stir until well coated. Bake for 25 minutes, stirring once or twice during baking. 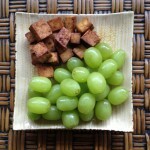 I find that freezing tofu improves the texture, making the thawed product more firm and less spongy. You can certainly skip this step if you're pressed for time. My friend Sheena introduced me to this perfect mix of salty sweet flavors. If you’re lucky you can usually find both items in the bulk bins at a natural grocery store. I’m a stickler for the Montmorency or dried tart cherries because they’re so much more flavorful than dried sweet cherries, but they do generally have added sugar. I usually get mine at Trader Joe’s or Costco. 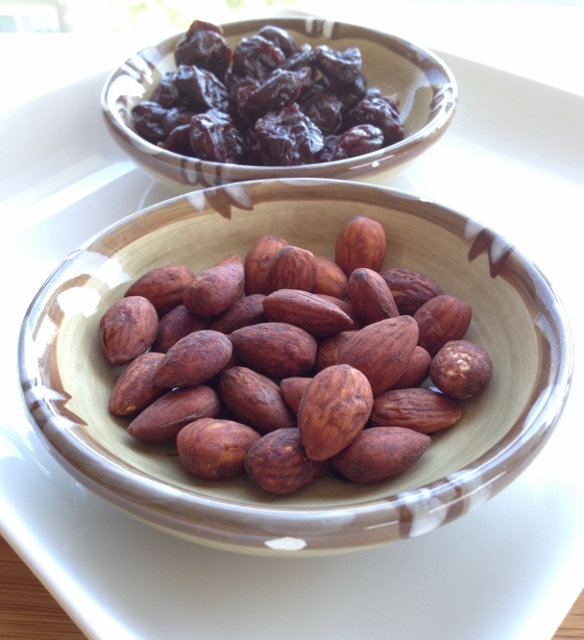 There’s no way around it, though: dried fruit and nuts are high in calories. That’s why they’re a favorite of backpackers, why they often show up in trail mix, and why this relatively small snack ends up being the highest in calories on the list. But nuts offer up plant protein and healthy fats in every crunchy bite, and this is the highest fiber snack in the bunch. 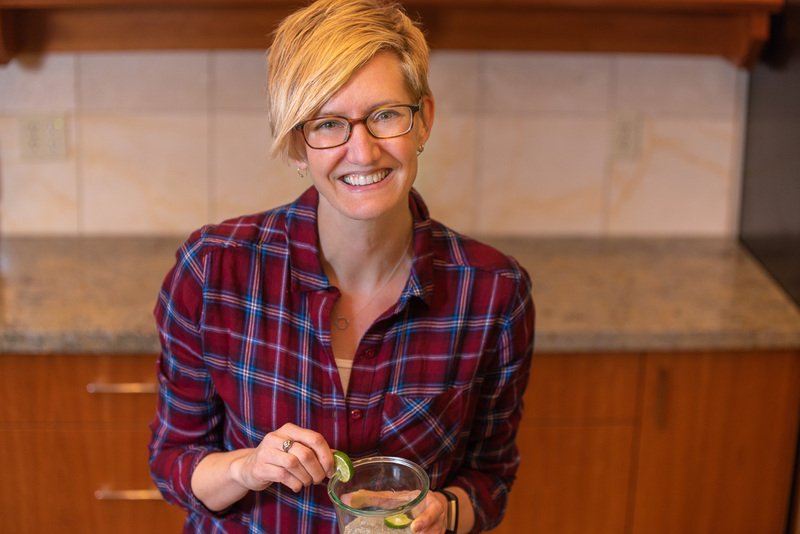 Have you found a way to satisfy a salty sweet hankering without giving nutrition the boot? 2) Don’t forget to lick the spoon when you’re done! Great idea, Jenessa. And both of your choices are nutrient dense foods, so together they make a fantastically healthy snack. Thanks for sharing!